Before checking Best WordPress Contact Form Plugins, read what is Contact Form and why you must need it. A contact form is basically a set of questions filled out on the webpage by your visitor that is automatically sent to your email when it is filled out. You can use it for anything you want but here are the common examples are, Feedback, Questions, Service/ Information Request etc. So you don’t need to worry again about spammers, all mails are handled by serverside and no chance to leak information. So here are 10 Best WordPress Contact Form Plugins. WPForms is the most powerful WordPress contact form plugin. This form allow you to create beautiful contact forms, subscription forms, payment forms and other type of forms for your site in minutes. It is 100% mobile responsive, so your forms will always look great on all devices like- mobile, tablet, laptop and other devices. It comes with drag & drop features, so you don’t need to know any coding skill. You can upgrade this free plugin as wish. Pro version price is $39 per year and $399 one time payment. In PRO version you will get extra features- AWeber addon, User registration addon, Campaign Monitor addon, GetResponse addon, Mailchiimp addon, PayPal standard addon etc. 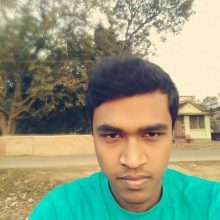 Just install this plugin, setup your form and add shortcode in any place and your form is ready. 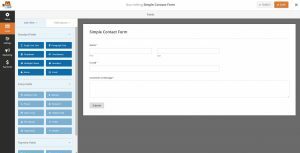 Contact Form 7 is a powerful and simple form that can manage multiple contact forms, plus you can customize the form and the mail contents flexibly with simple markup. The form supports Ajax-powered submitting, CAPTCHA, Akismet spam filtering etc. Its easy to setup, just go to setting and create your form. This form is 100% free, so you don’t need to upgrade or something. Caldera Forms is a different kind of WordPress form builder. You can create an awesome look form with its intuitive drag and drop interface. It has lot of features so you can cusmomize anything even buttons. Whether you are creating a simple contact form or a complex system, you’ll love the drag and drop editor. It is free plugin and can be upgraded to get extra addons which starting price is $49. Ninja Forms is the easiest way to build any form you need for your WordPress website. No longer mess with code or worry about made-up limitations. With a simple drag and drop interface, you can create form anytime. Here custom input masks allow you to restrict user input in your forms for things like phone numbers, currency, and dates. Ninja Forms also has a complete library of add-ons to take your forms to new heights. There are 40 Paid add-ons available, which price is $39 for single site. NM Contact Forms is free form which allows to create your form with drag and drop option easily. It has no premium version, so you are getting all A-Z features here. After installing this plugin you can control over each thing and each field and no coding skill required here. Some following field types available like- Text, Textarea, Email, Checkbox, Radio buttons, Single file upload, and Recaptcha etc. Recaptcha can be enabled from google, and you have to submit site key and secret key. WCP Contact form is a multi functional form, which can be used in many forms. Main feature of our contact form is ready-to-use set of the fields includes CAPTCHA, that you can immediately use after installation. Its is totally free, all that you need it is install plugin and add contact form in two ways- as shortcode via TinyMCE toolbar button, as widget to a page sidebar. If you want a creative responsive Free contact form with multiple templates and theme options, then Form Builder is a good option for you. The form includes all of the form field types necessary to create a complete contact form, where you can activate or deactivate, as well as rearranged. The responsiveness of the product allows you to become available for contacting using various gadgets. Pro version price starting from $15. 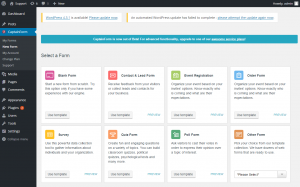 CaptainForm is a WordPress form builder without add-ons, easy to use, providing advanced functionality. It requires no coding skills and it’s ideal for building any type of form right from the dashboard such as: order forms, registration forms, surveys, polls, user-submitted posts and more. CaptainForm is a form builder integrated with many 3rd party apps and payment processors such as Google Drive, SalesForce, ActiveCampaign, Dropbox, PayPal, Authorize.net, Stripe and many more. But there is a limit with this form. Which means there are 4 different service plans available: a free plan and 3 paid plans, working on an annual subscription basis. Regular (Free): 3 forms, 15 fields/form, 500 submissions/month, 100MB storage space. And Pro version form starting from $35/year which gives unlimited forms, 5k submission, 500MB space and so on. 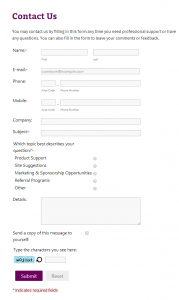 This kind of form is better than other Best WordPress Contact Form Plugins. If you are searching one just simple contact form, then it is a great option. It only contains Name, Email, Subject and Message. And a simple captcha sum. Use shortcode [contact] to display form on page or use the widget to display form in sidebar or any page. Contact Form Builder is the best tool for quickly arranging a contact form for your clients and visitors. The form includes all of the form field types necessary to create a complete contact form. The responsiveness of the product allows you to become available for contacting using various gadgets ans it also includes Captcha and ReCaptcha word verification. The form has an integrating Google Maps feature allowing you to display the location of your office using Google Maps. This is free plugin and you can upgrade it by purchasing a Pro version, which costs $30/Domain.